Popular, large, yellow freestone. Early harvest fruit is firm-ripe and tangy, later harvest flavor: high scoring in taste tests. Late July/early August in Central California. 500 hours. Self-fruitful. Cream colored skin with red blush. Greenish-white semi-freestone flesh. Juicy, gender, and sweet. Ripens mid-June to early July. Self-Fruitful. Requires 800 Chilling hours. Large yellow freestone, deep colored skin, with good flavor. Early to mid-season havest. Before Fantasia, but after May Grand. Panamint is suited to California and the warmer areas in the Southeast. It does not require a heavy winter chill. 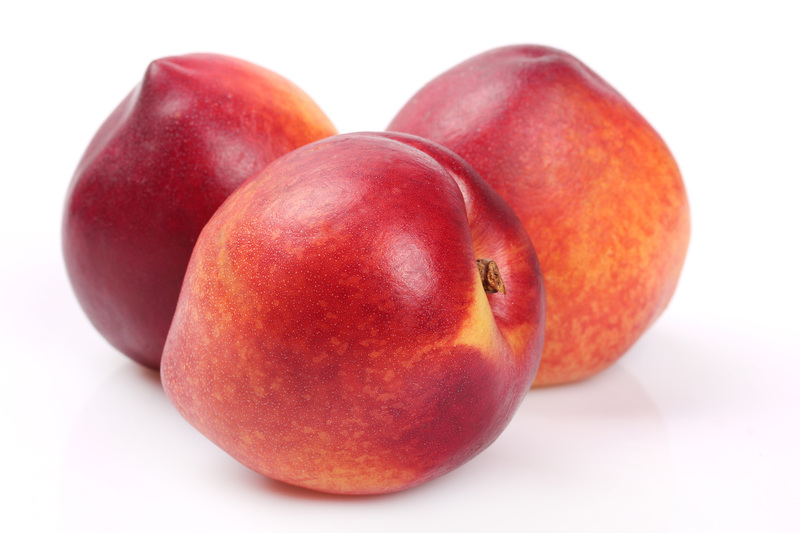 The nectarines are medium to large, freestone, bright red with excellent flavor. Midseason bearing. Most adaptable of all fruit trees for home gardens to maintain size and encourage new growth, heavy pruning is needed. Sweet, Juicy early season white freestone nectarine. Late June harvest in Central California. Estimated chilling hours 250 – 300. Self-fruitful.